While enjoying some free time during our PCS this summer, I've indulged in home improvement television shows. No matter which program is on, the one thing the designers always tend to do is knock down any adjoining walls to the kitchen to give the home an open layout. Trust me, making a small room appear more spacious encourages me to cheer along with the homeowners, saying “ooh” and “ahh” during the room reveal, as if we are all watching an incredible fireworks show! But, what if I jump off the “open concept” bandwagon for a moment and consider what is missing with this new layout? Once upon a time, the Air Force moved my husband and I to California. We were assigned a 1950s house on base where the kitchen was built long and narrow like a bowling alley lane. Some call this layout “galley style,” but it honestly had very little style at all! When the dishwasher door dropped down, it barely cleared the edge of the counter across from it. Highlights of this random space were two full-sized doors that closed on either end of the kitchen. One door lead to the front entry and the other led to the dining room. Since the abode was located in the middle of nowhere Mojave Desert, conserving any cool air was a top priority. When cooking, we would close both doors to the kitchen to contain the heat (and smell, if by chance my recipe went wrong!). With the stovetop or oven in use, we’d open the kitchen windows to offer ventilation and sometimes run a box fan, and it worked out well. My husband and I hosted a bunch of dinner parties during our time in that old school base house. Not only could we close off the kitchen to keep the adjoining rooms a pleasant temperature, we could also leave kitchen prep out of polite view. Pots and pans could be left to soak in the sink. Cutting boards with remnants of chopped veggies could linger until later clean up. The packaging from appetizers that “tasted like homemade” could be discreetly tossed in the trash. As the evening went on, dirty dishes could be collected and deposited there. As if with a level of Hollywood glam, guests were able to linger in the entertaining spaces of the home, the dining room, living room and patio, without setting foot in the kitchen! Additionally, with the kitchen doors closed, we as the hosts could enjoy every moment spent with our friends. We had no worries about what our guests might see and could simply delay clean up until after our company had left. Even if it may not seem ideal, there is a certain level of appeal with a home that does not have an open floor plan. Of course, in my dreams, my “closed off kitchen” would’ve had much more square footage! Possibly granite countertops? Stainless steel appliances? Oh, and since were in California, I would’ve preferred a view that looked out at the Pacific Ocean, rather than at a drooping palm tree clinging to life in the parched sand. 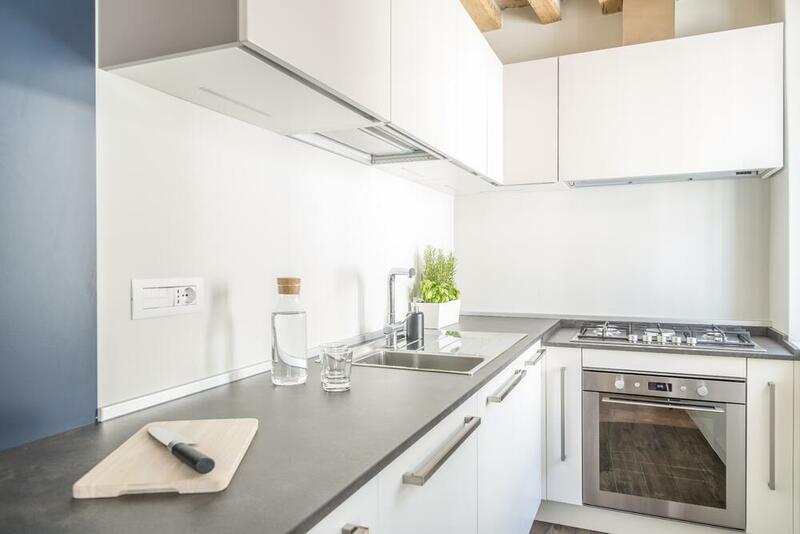 If you have dreams of a kitchen renovation but it’s not going to happen just yet, here are a few ideas to help make the most of your current space. Cut the Clutter: If you have a pantry or shelves available, store small appliances such as a toaster, mixer, blender, etc. out of the way. 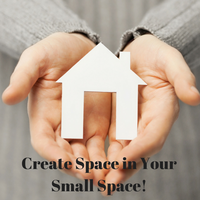 The less you have on your countertops, the more workspace you will have available, making the room feel more open. Let in the Light: Adding more natural light to your kitchen will give the illusion that it is more spacious. This could be done with big investments, such as adding a sky light windows or greenhouse type windows, or with small efforts, such as sheer window treatments or evening light amplified with LED lights tacked under upper cabinets. Limit the Kitsch: My grandmother had kitchen shelves filled to the brim with decorative ceramic salt and pepper shakers. Each time she fried chicken, after supper we grandkids had the chore of hand washing each piece that was within splatter distance! Although an adorable collection, having so much décor in a small kitchen was not ideal. Consider limiting the kitsch in your kitchen if you have small square footage. The minimalist vibe gives more of a clean look and leaves you with less to keep dusted and clean. Open to Possibilities: Open storage shelves lighten up a small space and make items easy to find and reach. If you’d prefer your mismatched dishware not be on display, consider storing your goods behind frosted glass cabinet doors. Additionally, a new coat of paint or more efficient storage may add more appeal to your cozy kitchen. Make the most of what you have, while you warm hearts and tummies with what you cook up in your kitchen!